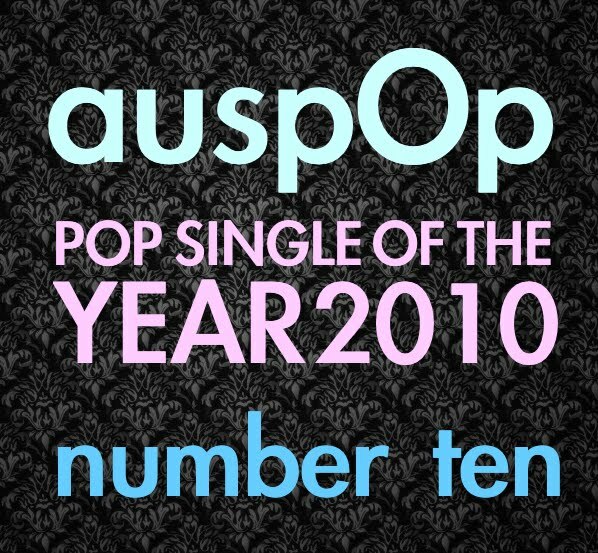 Okay, so Kelis premiered this single on her Twitter page back in November last year, but given it was officially given a release in early 2010, we’re counting it in our top ten pop songs for 2010. With more than a little help from one David Guetta, ‘Acapella’ marked a daring musical departure for former hip hop star Kelis, steering her in a decidedly electro/dance direction that set the floors alight across the United States and Europe. What starts out as merely a bud full of beats and bleeps slowly opens up into a rich, luscious chorus in full sonic bloom. Naturally, it got virtually no love at radio in Australia and didn’t chart. It was reportedly written in tribute to her newborn son, who also makes a cameo at the end of the official video (below), which is visually stunning, what with its tribal overtones and imaginative headwear. It’s a corker. 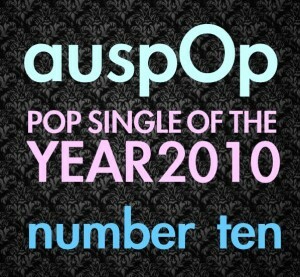 We give you our auspOp number ten pop song of 2010 – Kelis with ‘Acapella’. Ahh, I knew you rated this song highly. I never really enjoyed it personally, which was a bit odd, because I’m a massive DG fan and have also enjoyed other songs from Kelis. But this track just doesn’t work for me, too monotonous.